We had out Terry and Marvin on the Lehigh for the first trip of the year. Overall the fishing was pretty tough. They got into some fish, but had to work for all of them. Lack of bugs was probably the biggest factor working against us. For some reason the insects just never materialized, but the two of them persevered and managed to stick a few. For them part streamers and wet flies were the most productive patterns. Water temp was 58 Fat Palmerton in the latter portion of the day. And we did manage to land one fin-clipped bow. It was fat and fought like an Upper D bow. What a great addition to the Lehigh River fishery these PFBC fish-clippie bows are!! Hope to tangle with many more! 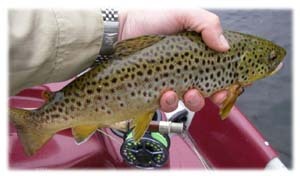 Dry fly fooled brownie. Caught on a hendrickson comparadun. Over the weekend we were able to get out for a cold and blustery float. We floated from the new ramp in Bowmanstown down to Walnutport. At the start the conditions were tough for the fisherman. WIND and lots of it. The water was also up a bit (1,400cfs at Lehighton) from the rains Friday night, despite the fact that the Corps limited the weekend release at 400cfs. Fortunately, the wind did die down some. So much so, that we found some rising fish. So obviously bugs were hatching and were on the water long enough for the fish to take notice. Actually, for the conditions the rising fish action was pretty good. So much so that it looks like the Lehigh is picking up, right where it left off last fall! All the fish we got into were fat a healthy looking. Although we did not land any rainbows we did stick a few that we know of. The bugs we did see were mainly olives, and hendricksons. Although the latter could have been quill gordons since we did not get a good look at them. Whatever they were, they were big. Size 12s. The fish were not very picky. Any well presented drift, had a mouth coming up to eat. Pretty cool stuff. April 14, 2010 - Apple Caddis Are On! For the SE PA limestoners that have this bug, well, they are hatching. The heat of last week kicked them off, and from here on out - for who knows how long - the fish will be looking up for these bouncing bugs. Not sure what it is, but trout seem to go crazy over these things. Maybe it is like a cat and mouse game, where the emerging caddis is like, 'yea, see if you can catch me,' as they rocket toward the surface...because there are times when you will see fish 2' out of the water going after the adult. Whatever the case, when the caddis start hatching, the fish are looking up. Let's just say, dry fly season has commenced. Also, don't forget to give a caddis worm a try. 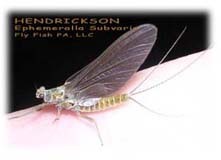 Sure, we all like to catch fish on dries, but a caddis worm or emerger can be an even more effective fish catcher than the full-on dry. The plan for this weekend is to get out on the Big Lehigh. We shall see!? Lehigh trips start soon, and dates are limited, so get in touch if you want to hit it! CDC and brite green. 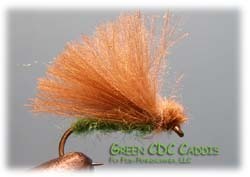 This pattern, depending on the weather floats like a cork and does a good job imitating the apple caddis. To the right is what Walter looked like a few days ago - 1,380'ish, and about 25% of flood storage. This weekend looks like another one of those "bonus" weekends for the whitewater folks as the releases will once again be in the 1,000cfs range. 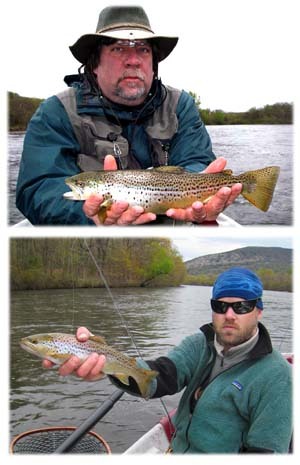 Combine this release and last weeknds purge with the mid-week yo-yo action due to the grout work going on at Walter, and you've got a rough start to the Lehigh River trout/fisherman season. The fish and the fisherman just can not seem to get anything consistent going when it comes to flows so far this early season. Fortunately next weekend (Opening Day) and the following have a restricted release of 400cfs. Not so much a fishing report since we did not get out and do any fishing, but in our travels we did notice a lot of folks logging some Opening Day hours. 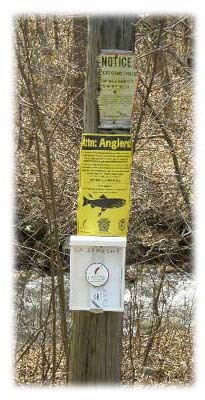 Travels took us to the Lehigh River watershed where we were hanging posters to educate fisherman about the PFBC's fingerling study and along Lizard Creek anglers were crawling about. In Walnutport the canal was elbow to elbow with families wetting a line. No doubt the beautiful weather helped. Some folks were even giving the Lehigh a shot, even though it was certifiably ripping! 4000cfs at Lehighton is a lot of water. That said, folks did catch fish - some nice bows and browns. Guys were also looking to float the Lehigh is some not-so-sea-worthy floatables, considering the conditions. Hopefully they wade out ok. Along the way we even saw Daryl Pierce, Area 5 biologist with the PFBC, who was out and about doing an opening day creel survey. He made a comment that someone had caught a fin clipped trout from the Lehigh, but it was not a PFBC fin clippie. Huh?! Is someone else out there clipping fins? A rogue clipper? Some of you may have been noticing the erratic releases from Walter. 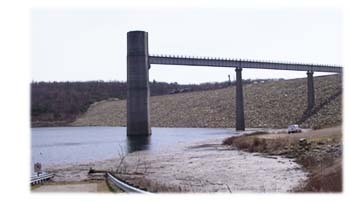 Well, the reason for this is to allow for the grouting project to take place up at the dam. I guess in order to facilitate the grouting the dam tenders need to drastically cut back the release on a daily basis. We are not sure how long this will be taking place for, but we hope to get an answer.